During my growing up years, Thanksgiving dinner always meant a huge feast at Granny’s house. Everyone brought a dish or two and this worked out well, since everyone had their own specialities. Granny’s were her home-made egg noodles and cornbread dressing. I haven’t had a stable Thanksgiving table for years. Once I married, I became a Thanksgiving vagabond, spending many Thanksgivings with in-laws, a few at either Granny’s or my mother’s, but especially in my Texas years, I enjoyed a quiet smallish dinner with my husband and children. Since returning to Oklahoma, I’ve celebrated Thanksgiving in three places in three years. This year I’m staying home. I’ve invited family from hither and yon, a mix of his, mine and ours. My son Kyle is hoping to bring one of his college friends, an international student from Portugal, who has never experienced an American style Thanksgiving dinner. And of course, the item that received the most press from my son to his friend was our family legacy of egg noodles. My table may have changed with the year, but Granny’s noodles and dressing have been a faithful Thanksgiving staple of my moveable feast. Noodle making is more art than science. The ingredients are few, the measurements approximate, the process requires time. I learned to make Granny’s noodles on a sunny autumn weekday when I was twenty-something. My girls were young — Kate, four and Kara not yet crawling. Even now, I see us all gathered in Granny’s kitchen. It is time to roll out the noodle dough, which Granny always does on top of her kitchen table that she covers with torn-up paper grocery sacks dusted with flour. As I divide the dough for rolling, I can hear Granny say, “Jan, be sure and roll that dough real thin.” Then, later, after the dough has dried, when I cut a few noodles too wide, “Jan, be sure and cut your noodles thin.” A narrow thin noodle was best in Granny’s book, as thin translates to a tender noodle. As soon as the noodles were dry to the touch, Granny would package them in a leftover bread bag for the freezer. Granny always made her noodles in advance, at least a couple of weeks before. And when she was ready to cook them, the noodles went straight from the freezer into the hot boiling chicken broth. More than twenty-five years later, I have become Kara’s teacher. Sometime this weekend, we will be getting together for Kara’s second lesson. And though I don’t know the day or the hour, I do know how the story will go. We will do everything just like Granny did, following her unwritten recipe that is better passed on by hand than in longhand… or in keystrokes on a screen. In my life, this is how we make noodles. — one generation teaching the art to another — repeating the same process and hints until your hands know what words are unable to describe. Practice makes perfect. From Granny’s life to mine… and now to Kara’s and your’s. To mix: Mix salt and flour in a bowl. In a larger bowl, whisk eggs with cream until fully mixed. Whisk in one cup of flour mixture, removing all lumps. Then, with a wooden spoon, mix the second cup of flour until fully incorporated. On clean flat surface, pour out remaining 1/4 cup of flour and place noodle dough (will be sticky to the touch) on top of the flour — knead in flour until dough is smooth and slightly tacky. Any leftover flour can be used for rolling or discarded. Let dough rest for 10 minutes. To roll: Divide dough into 3 even pieces. Sprinkle remaining flour over rolling surface –torn up paper sacks really helps speed up the drying process. 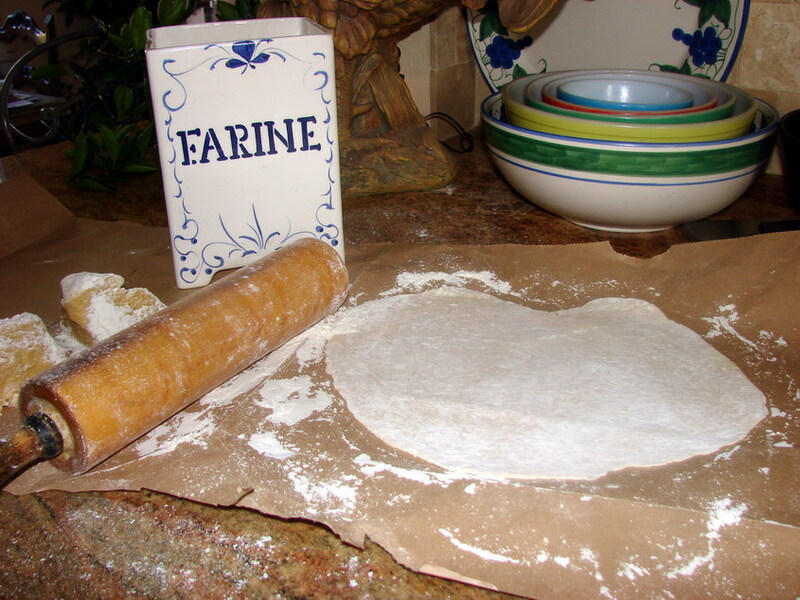 Roll dough with a rolling pin, continuing to coat dough with flour, until it’s as thin as you can roll it — 1/8 to 1/16 inch. Continue until all dough is rolled. Let dry for about an hour, turning once or twice to ensure even drying. 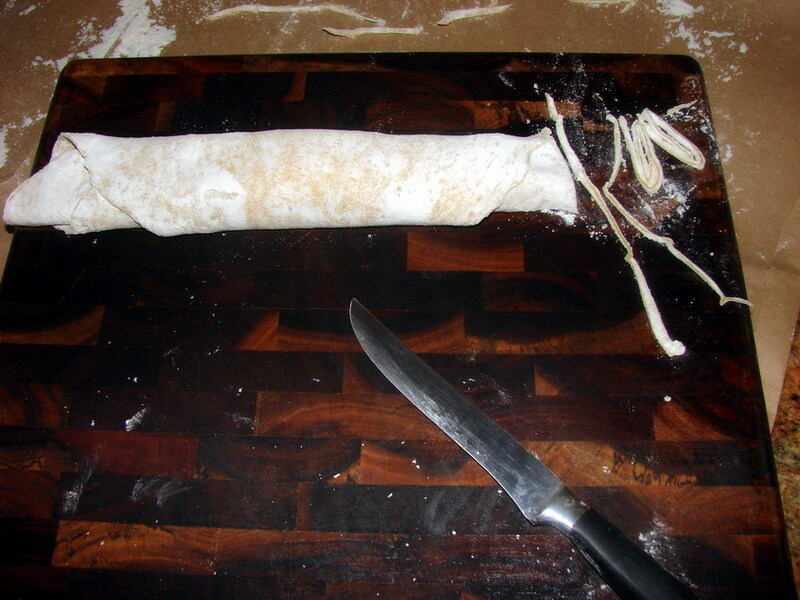 To cut: Roll dough into a tight rolls (like a rolled newspaper) and cut the roll with a sharp knife on a cutting board. Unroll cut noodles. Allow two or more hours of drying time — humid days extends drying time. Alternatively, you may cut the dough into narrow strips without rolling. When I use this method, my noodles are typically shorter in length. After noodles are dry to touch, place in a freezer bag and into the freezer. To cook: In a large pot over medium high heat, bring 5 to 6 cups of chicken broth to a boil. Taste to adjust salt seasoning once broth is warm. When boiling, drop in frozen noodles, reduce heat to medium to medium low, and cook covered for 10 to 15 minutes. Stir occasionally to avoid sticking. Noodles and broth should be creamy rather than soupy — and water can be added where too thick. To serve: Over cornbread dressing or mashed potatoes or as a straight-up side. Aunt Florence always told Mother and Aunt Blanche that their noodles were too think. She told them to cut them thinner. I suspected this might be the case, though I imagined it would have been Granny’s mother rather than older sister…. Thanks for the additional bite of family folklore.